Cat declawing is a thorny issue and deciding whether to do it or not is one of the most important decisions a car owner has to make. According to the veterinarian Neil Wolff, declawing is not only unnecessary procedure but it also inhumane. Declawing is an interference with the cat’s nature, and people often decide to do it because of their lack of information and incorrect knowledge. Dr. Nicholas Dodman, who is the author of The Cat Who Cried for Help, and the director of the Animal Behavior Clinic at Tufts University School of Veterinary Medicine, thinks that declawing is the same as mutilation to a tee. He also says that this procedure is used as a model of severe pain for the testing of analgesic medications. Declawing is a common practice in the USA, but it is not popular in Europe. In fact, this procedure is against the law in many European countries, for example in England, Germany, and Switzerland. The standard declawing procedure involves the removal of the claws, the cells that are responsible for the claw’s growth, and a part of or all of the terminal bone of the toe. This procedure aims to stop the cat from scratching furniture, people or other animals. 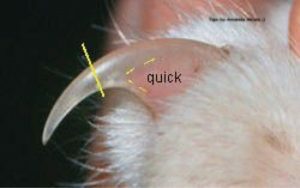 Declawing can be defined as an amputation and is similar to the removal of the fingers of the human hand at the last knuckle. The manipulation causes significant pain to the cat, and the healing process is quite painful, too. Cat owners should know that the cat’s claws are not toenails as in other animals. Claws are movable digits that are attached to the muscle in the same way fingers are attached. Cats have powerful ligaments and tendons that extend and retract the claws. If you remove these, the cat will not be able to grasp, walk, run and spring properly. 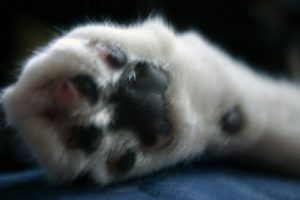 If the end digit and the claw are removed, the sensory and motor nerves are damaged and destroyed. Thus the cat should walk on the stub end of the second digit. People who undergo such procedure usually rest while cats must continue scratching in their litter box, they walk and try jumping, no matter the pain they feel. Declawing can be carried out in several different ways but the aim is the same: to completely remove the third phalanx, which is the last bone in the toe, and the claw that is growing from it. Some veterinarians use laser surgery which is considered to be less painful and to cause less bleeding. The procedure uses a laser to cut the tissue by heating it. This means that the bleeding, the pain and the healing time are significantly reduced. However, the cat’s toes will still be in bandages and a few weeks will be needed before the cat starts walking normally again. In some cases, cats recover very quickly; this is typical for kittens. There is another method, called penectomy, which is becoming very popular. During this procedure, the law is not amputated but is removed a piece of the tendon that controls the extension of the claws. The result of the surgery is intact claws that are permanently extended. Cats usually can use their claws to some extent, but they cannot scratch properly. 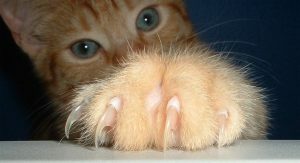 Cats cannot sharpen their claws, and they grow excessively, so claws’ trimming is required very often. The scratching post should be strong enough and tall enough. You can use sisal and corrugated cardboard for the service of the scratching post. The usage of carpet is not recommended as it tears up very easy and the cat may be confused with the carpet on the floor and scratch there instead of on the post. Cats should be praised when they use the post. You can try making it a fun place by putting the toy on it or around it. The position should be easily accessible. In case you want to make your cat stop scratching a piece of furniture, place the post in front of it and gradually move it away when the cat begins using it regularly. You should train your cat to scratch on the “right” things. Praise the cat every time she scratches on the post. If the cat scratches on the place where she should be doing so, call her by her name, tell her “no” and move her to the scratching post. You can put the cat’s front legs on the post and start making scratching motions to show her what she is supposed to do. Also, you can dangle a toy on the post, and the cat will touch the post as she goes for the toy. You should trim your cat’s claws regularly because it is essential for maintenance of the cat’s hygiene. This will also reduce the scratches you and your furniture may suffer. If you clip the cat’s claws once a week, the destruction of furniture caused by scratching will be reduced to a minimum. It is recommended that the clipping is performed by two people – one to hold the car and the other to clip the claws. Do not use regular scissors. You should use only special cat clippers. Also, remember to clip only the tip of the claw. Be careful about veins that are near the Claw’s base. Some years ago, a new product that reduces the damage on furniture had been presented on the market. “Soft Paws”™ (or Soft Claws®) presents plastic nail caps. They are glued to the cat’s claws after the claws have been trimmed. The results of using the product are great, and there are almost no scratch damages on the furniture. The caps should be replaced every month. If you love your cat and care for your cat, you should not declaw her. You can train the cat to not scratch the furniture if you follow the advice mentioned above. However, a declawing procedure is excruciating and unnatural. So, give your cat love and affection, and provide her with a long and happy life without declawing it.